SOLEDAD, Calif. – There is a calming resonance of nature’s finest and subtlest sounds at Pinnacles National Park. Leaves rustle and birds warble as the wind flows between the rolling mountains. On a good day, park visitors might see endangered California condors circling overhead, riding thermals on wingspans stretching up to 10 feet. The park manages 44 condors in the wild and serves as a release site for introduction into the wild. Rachel Wolstenholme, condor program manager at Pinnacles, is pleased with how well these giants of the sky have rebounded, and she foresees their removal from the endangered-species list in the next 10 years. In 1987, condors were on the brink of extinction. All 22 birds remaining in the wild were taken into captive breeding through collaborative programs with the U.S. Fish and Wildlife Service, Ventana Wildlife Society and the Peregrine Fund. Three decades later, the California condor is slowly rebounding. Earlier this fall, four were released at Vermillion Cliffs National Monument in Arizona, where about 85 condors live in rugged terrain along the Arizona-Utah line. Seal Faith works closely with condors in captivity, observing their behavior and social interactions. “It’s not only a fascinating species but a fascinating program to work with,” Seal Faith said. The zoo started to exhibit the condors in 2009. She says there are now about 500 condors in the world, 300 of which are in the wild. But the scavengers, which survive off the remains of animals killed by hunters, still battle their leading cause of death: lead poisoning. “The only issue is that lead ammunition fragments into many, many, many tiny pieces inside a carcass,” Wolstenholme said. She doesn’t want to discourage hunting but seeks to inform hunters of alternatives to lead ammunition. Still, Wolstenholme is confident California condors will be taken off the endangered-species list in the near future. “I like to say less than a decade. I actually know we can get there sooner. It’s all about making sure that they have a clean food resource,” she said. 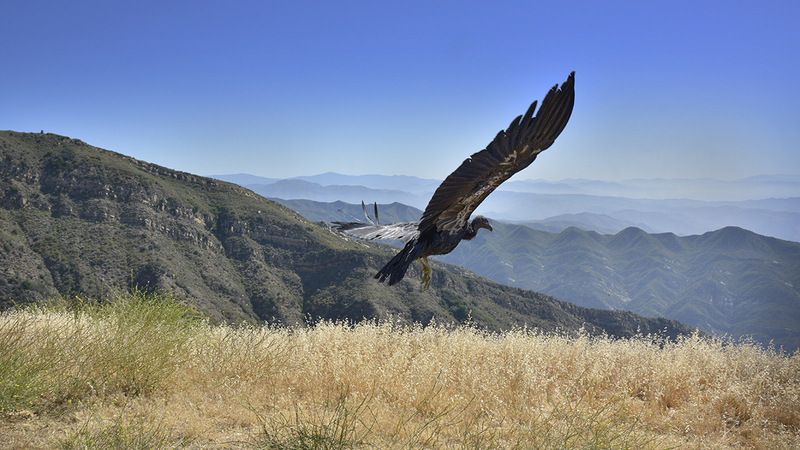 In December, Pinnacles National Park will release three California condors into the wild. “We’ll open the trap door for them, so they can leave when they’re ready,” Wolstenholme said. Joint efforts and successful releases keep her and Seal Faith motivated.